This can be a genuinely spending budget build which will get you deep into maps on self-found gear, which you can then be capable of fill out your atlas. The build only definitely has two needed uniques which might be inexpensive off self-found currency early in a league and incredibly affordable later within a league. Choosed fortitude instead of First Strike because when your fortify is down you lose the stun immunity. Cast adrenaline with RF or blood magic is boring and dangerous, so choosed fortitude. If you are a good player,you can grab First strike for more damage. First goal on tree is the duelist mana/life leech , you will drop it when you reach the claws nodes.It depends on your playstyle: aiming towards life or damage nodes. Like to level up with frost blade ( sunder, cleave, ground slam are good skills too )and to swap into reave when you could use multistrike. For weapon try to get rare or unique claw based on your level, claws are not required but the claw life gain on hit implicit is very cool when your leech is low on levelling. Remember to level up your blade flurry, setting it up in second weapon slot. Need anti bleeding-anti freez flasks, the anti curses isnt mandatory. For jewels mods look for life-atttack speed-crit multi-area damage. If you have any questions about the build, would like to show your support, or just want to chat it up about POE, other games, anime, books, music or w/e else. It must be fun and engaging, not cost an extraordinary amount of currency, and have the ability to be a league starter with the ability to do all content later on as you upgrade and invest into your character. On top of this it must have fast movement or move skills and not have to worry about any weird issues that ruin builds. + Demonic Reave MTX looks amazing! – Cleave can be used to level the entire way until level 38 when you get multistrike. 4 Link it when you can with onslaught, melee physical damage, and Maim. – Set up a 4 link Blade flurry for single target with melee phys dmg, conc effect, ele dmg with attacks. – Use any 1 hand rare weapon with the most flat phys dmg on it. Crit/Attack speed don’t matter much at this point though I hate slow weapons personally. Base does not matter at all here either. Claws, Swords, Daggers w/e is fine while EARLY leveling. Once you need leech, you need to have a claw for soul raker passive. – Use ornament of the east claw as soon as you can and upgrade to bloodseeker claw as soon as you can after that. – For armor pieces (helm/chest/boots/gloves etc) just try to get a good amount of res and any life you can. – Use a mana flask until your mana leech is good enough to sustain your skill. Especially for boss fights in which you will run out of mana quickly. – If it is not the start of a league elreon jewelry while leveling is wonderful. Along with your normal leveling uniques such as: Goldrim, wanderlust, tabula etc. Gloves – NONE! Spiked Gloves implicit is best you can get. If you do not have Spiked gloves then get w/e you want. Boots – Two-Toned boots are one of my favorites if you can find a good pair, the extra resists really help. Leech/increased attack + cast speed are both good ones too but only work if you have killed RECENTLY (within last 4 seconds) so does not work with single target + bosses which is by far the most important. Helm – 12% increased reave radius is BiS. Can get 40% increased blade flurry damage, but the reave radius is definitely a lot nicer as our damage is already completely insane. Minor God – Shakari. Simply like the reduced chaos dmg, caustic cloud dmg, and immune to poison. Major God – Sould of Solaris is the one I run. Reduced Ele dmg, additional phys dmg reduction, less dmg from area dmg hits, cannot be hit by more than one crit every 4 seconds etc etc. Feel free to change this as needed or use whatever other Major god you would like if Brine King is not for you. For probably the most part, they may be understanding tools for beginners to ease them into the game. 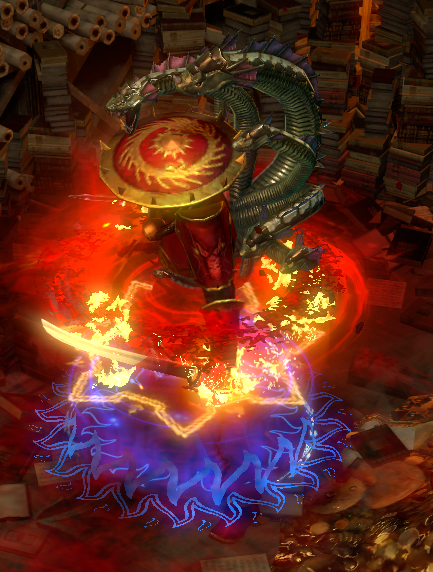 For much more Path of Exile 3.4 Builds, Read more at U4gm.com. Just a reminder: you can get 5% coupon code for free from the reps if you Get Poe Currency order from this article.